On New Year’s Eve fireworks manufacturers the world over will finally be able to relax after their biggest sale of the year. But this day has been a fireworks staple for a surprisingly long time, although the fireworks themselves have changed quite a bit. 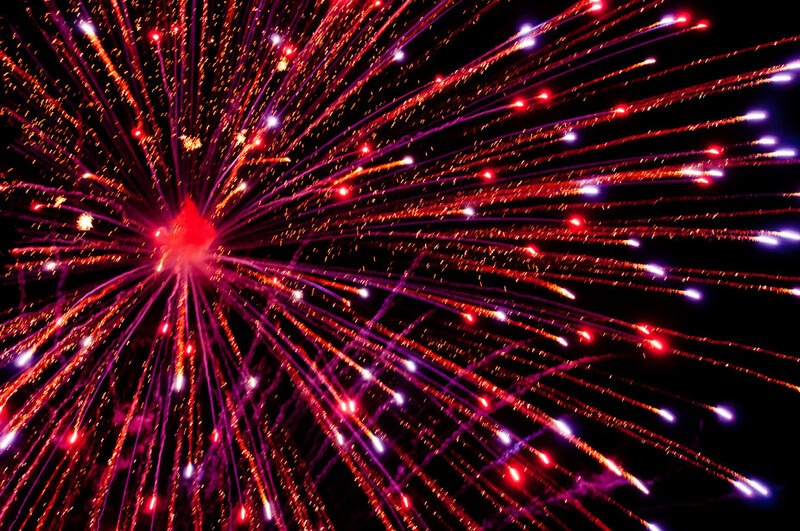 Fireworks, as everyone knows, were invented in ancient China. The details of their actual origin are lost to history, but they were probably developed as a way to keep mountain men and spirits at bay using loud bangs. Dried bamboo stalks would emit a noisy crack when thrown on a fire, and gunpowder, another Chinese invention, rammed into bamboo may have first been used to magnify this startling effect. An illustration of a fireworks, 1628-1643 edition of the Ming Dynasty book. 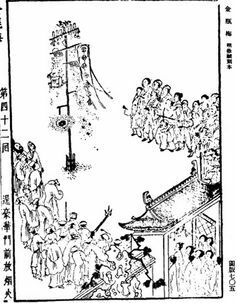 By the 11th century there were gunpowder weapons in China and in the early 12th century, the Chinese used firecrackers and fireworks (yen huo) to celebrate a visit of the Chinese emperor. Chinese fireworks included rockets (or “earth rats” because they were fired over the ground) and wheels, coloured smoke-balls, crackers and fireworks attached to kites. They all made a “glorious noise”. Gunpowder and fireworks might have been invented independently in Europe, but they probably reached Europe via the Mongols, who spread west from China as far as central Europe by the mid-13th century. 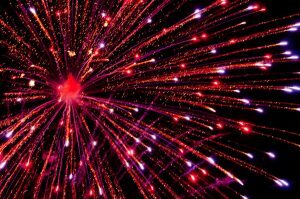 In 1267, the English monk Roger Bacon recorded seeing what were very likely firecrackers, which he compared with the flash of lightning and growl of thunder. 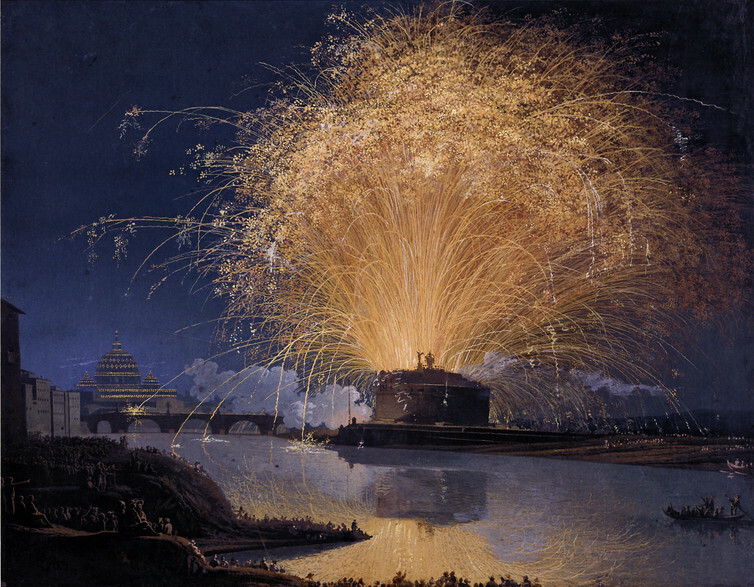 Fireworks on the River Thames, Monday May 15 1749. By the 15th century, rockets were being used in Europe for military and peaceful purposes. 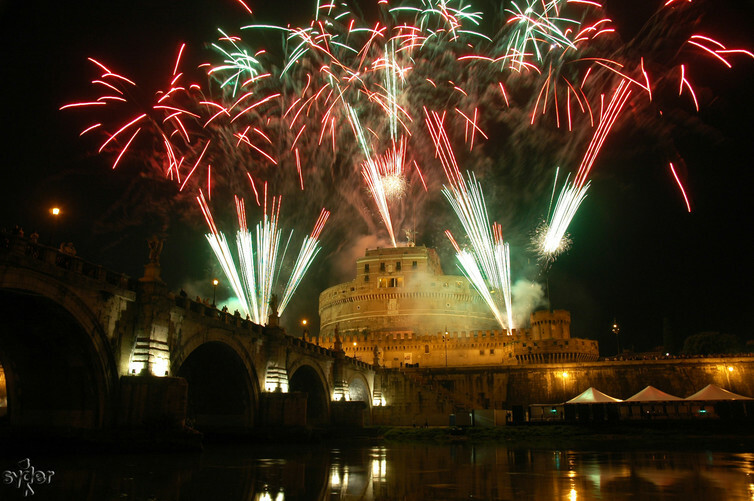 Italian and Spanish cities in particular began to use fireworks for outdoor celebrations. The Italian metallurgist Vannoccio Biringuccio described festivities in Florence and Siena for feast days. These included “girandoles” or whirling decorated wheels packed with fireworks which were suspended from a rope hung across a street or square. Fireworks were also used in the German lands. 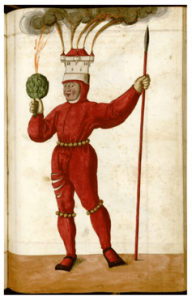 An elaborate colour-painted book commemorates the Schembart carnival of Nuremberg, which saw men dressed in brightly-coloured costumes parading through the town. Often these included some kind of pyrotechnics. One image shows a man wearing a hat in the form of a castle with fireworks and smoke shooting up from the towers, and interestingly, what looks like a smoking artichoke. But the greatest of early European fireworks was surely the Girandola (not to be confused with Biringuccio’s girandoles) staged for the election of a new pope at the Castel Sant’Angelo in Rome. This imposing castle on the banks of the river Tiber was originally constructed by the emperor Hadrian as a mausoleum for his family, before being converted into a fortress and later a papal residence. Constructed so that after they have moved upwards with a long tail and seem to be finished they burst and each one sends forth anew six or eight rockets. The effect was a huge explosion of fire and noise and smoke, which spectators compared to the heavens falling to the earth or the fires of hell – a truly apocalyptic experience. Jacob Hackert, Fireworks over Castel Sant’Angelo in Rome, 1775. By the 16th century, firework festivals similar to the Girandola had spread to northern Europe. Styles of display proliferated and diversified. 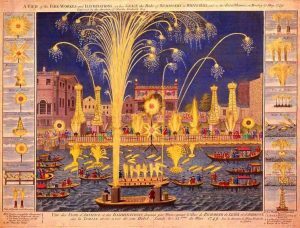 Most fireworks in this period were court spectacles, staged to celebrate princes and their actions, and often involved elaborate scenery, artificial castles, figures of monsters, and an array of exotic pyrotechnics. In 1533, the English celebrated the coronation of Anne Boleyn with barges on the river Thames carrying “wild men” wielding fire-clubs and a “great red Dragon continually moving and casting forth wild-fire”. Queen Elizabeth I also enjoyed fireworks displays in the 1570s. German princes staged mock battles and pyrotechnic pantomimes featuring contests between giant dragons and fire-spouting whales. French kings saw astrological fireworks, featuring lions (Leo) and fireworks made to resemble suns and stars. Audiences marvelled at these events, which could cost a small fortune to produce, and they also found fireworks terrifying. These were, after all, a rare and novel experience for many people. 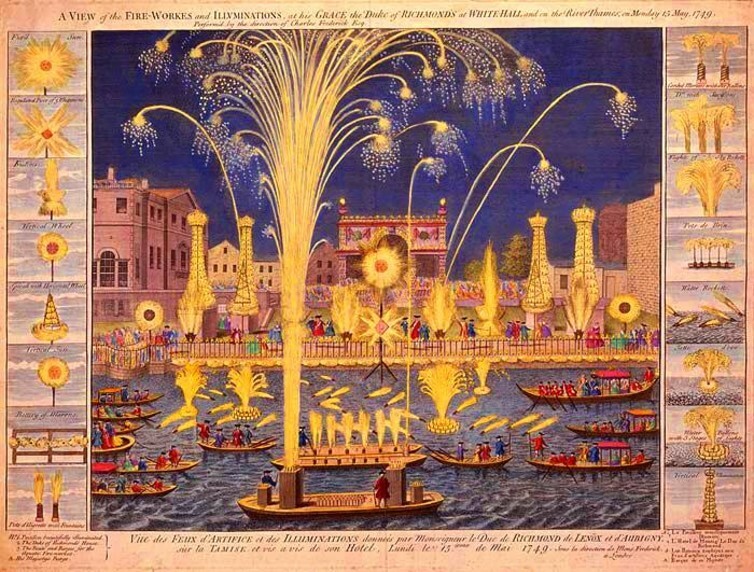 In that regard, the earliest fireworks were quite different to the ones we enjoy today. We’re very familiar with fireworks now, so it takes a grand display to impress us. 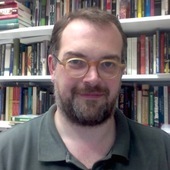 The courtly politics and elaborate decorations of the past are long since gone thanks to economising tendencies in pyrotechnics in the 19th century. In the 20th century fireworks became simple displays of coloured light, dropping the dragons and castles, to the point where one critic claimed that fireworks were the purest form of abstract art. 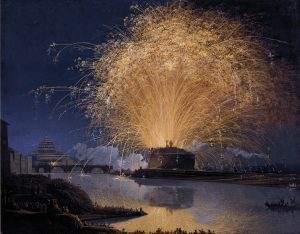 But the basic vocabulary of fireworks – using gunpowder tightly packed into containers to make an array of explosions, flashes, bangs, sparks, and noises, together with the tremendous scale and drama which these effects create – has remained a constant source of astonishment to audiences for many hundreds of years. Fireworks, re-imagined in creative ways, will no doubt continue to amaze and impress us for many centuries to come.